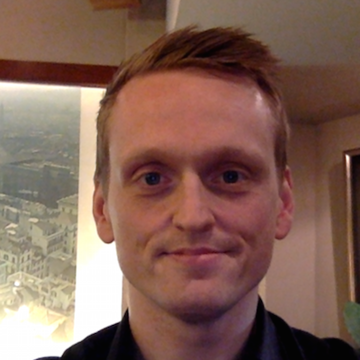 Martin Dyrvang is 31 years old and from Denmark. He studies Chinese Studies at the University of Copenhagen, and is currently finalizing his BA. During the course of his studies, he has been studying in Denmark, China and Taiwan. All together he has spent 3 semesters as an exchange student at National Taiwan University. His main focus in studying Chinese Studies is the part that includes language and culture. Martin Dyrvang is from Denmark. He majors in Chinese Studies for Bachelor degree at University of Copenhagen. Through the Taiwan Experience Education Program (TEEP), Martin had the chance to exchange study in National Taiwan University (NTU 台灣大學) in Taiwan. TEEP provides short-term professional internship for foreign students with high quality Mandarin Study. 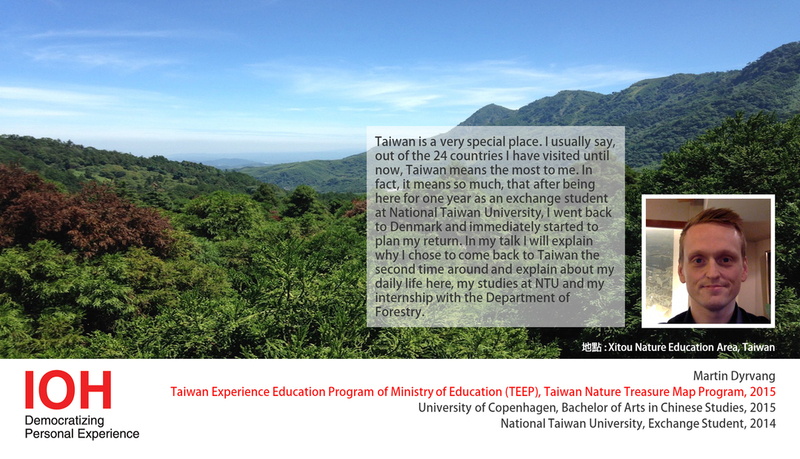 There are several programs under TEEP, and the one that Martin participated was the Taiwan Nature Treasure Map Program. Martin stated that the main purpose of this program was to place Taiwan on the global map via showcasing the wonders of nature in Taiwan. This program was originally initiated by Department of Forestry in NTU. Interns of the program can explore the natural beauty of Taiwan by visiting the forestry areas zoned for educational and experimental purposes, formally called Nature Education Areas. After the trip, student would have to make a treasure map to share their favorite spots. These Nature Education Areas are located in different parts of Taiwan, some are located in cites of Xitou, Aowanda, Dongpu, etc. Martin applied Xitou as his top priority of Nature Education Area for its beautiful sceneries and abundances of natural resources, and he eventually got assigned to Xitou Nature Education Area as his area of research. In Martin’s talk, he shared his memorable natural and cultural experiences in Xitou, Taiwan. In his numerous excursion experiences with nature, he captured the beauty of Xitou with images and video clips. During his research in the forest, Martin managed to overcome his fear of height by climbing up the 40-m high CO2 observation tower to view the whole forest and to sample CO2 level in different heights. Looking down from theCO2 observation tower, he regarded the forest as Jurassic Park without dinosaurs. In one of his many excursions, he stumbled upon a frog while strolling in the forest and he made friend with the frog. Besides frog, he also met Formosan macaque monkeys, squirrels, wild boars, amphibian and other mammals. Exploration is the vital part of the Taiwan Nature Treasure Map Program where interns were encouraged to explore by themselves. Therefore, Martin rent a scooter to explore further beyond Xitou. He went to Sun Link Sea (杉林溪) and the scene was breathtaking and ‘beyond description’. Martin thought that people should not miss this amazing place and should pay Sun Link Sea (杉林溪) a visit. In addition to Sun Link Sea (杉林溪), he also strongly recommended visitors to visit Ali Mountain for its beautiful sunrise - an orchestra of nature. In cultural experience, he became familiarized with history and culture of Taiwanese aboriginal tribes in Taiwanese mountains through a friendship he cultivated in Xitou. This special friend was serving Taiwanese military service and stationed in Xitou where Martin was performing his research. This special friend is from one of the sixteen aboriginal tribes - Tsou Tribe - and introduced Martin to aboriginal tribal history and culture. Throughout the development of their friendship, Martin claimed that he was initiated in the Tsou Tribe in Ali Mountain. He was invited to stay with them, dress in their traditional clothes and to join their festivities and activities. “I feel I’m 50% of Tsou tribe and 50% of Taiwanese. I think I’m 0% of Danish now”, said Martin after visiting the Tsou tribe. He hoped he could go back again. After this wonderful trip, he and his fellow internship decided to finish the treasure map assignment by constructing a website. They gathered information and took pictures there. Through this English website, they hope to promote more English speakers to come to Taiwan. Many foreigners mistake Taiwan as Thailand. Very much bothered by this fact, Martin tried hard to ‘expand people’s consciousness about Taiwan’ and ‘remove the misconceptions of Taiwan as Thailand’. In his talks, he shared why he came to Taiwan and fall in love with Taiwan. In University of Copenhagen, Martin was required to exchange to Mainland China for one semester, and he went to Hangzhou. During the studying time in Hangzhou, he heard some interesting things about Taiwan. He then planned to come to Taiwan one day. After he came to Taiwan, he was astonished by the cultural difference between Mainland China and Taiwan. Martin fell in love with Taiwan for not only he can practice Chinese language and also learning Chinese culture. When he went back to Denmark, he missed Taiwan so much and applied to come back again through exchange programs. In addition to falling in love with Taiwan as a country, Martin also fell in love with National Taiwan University (台灣大學). He loved how beautiful the campus is, the diversity of academic disciplines, the ambiences of the campus, and many other great qualities about NTU. In his school life in NTU, Martin received very positive experiences through different activities. He joined football club for he was a football maniac. In extracurricular activities, Martin signed up to volunteer as English teachers for kindergarten children. This experience not only allowed Martin to further his Chinese learning, he was also able to practice his communication and teaching skills. In addition, he highly recommended getting involved in Language Exchange activities. He once took the change to cooperate with a local café and hosted an event to allow foreigners and Taiwanese to practice language exchange. He felt a sense of achievement when he saw the participants become friends. At the end of his talk, Martin shared his observation and experiences that is unique in Taiwan: 7-11, night market and other cool things!